A school is attempting to tackle forced marriages by handing out spoons to urge students to hide them in underwear to trigger metal detectors at airports. Pupils at the Co-operative Academy in Leeds have been told to hide the cutlery there if they fear they are being taken overseas to be married. It will trigger metal detectors at airports, allowing them to raise the alarm with security staff privately. 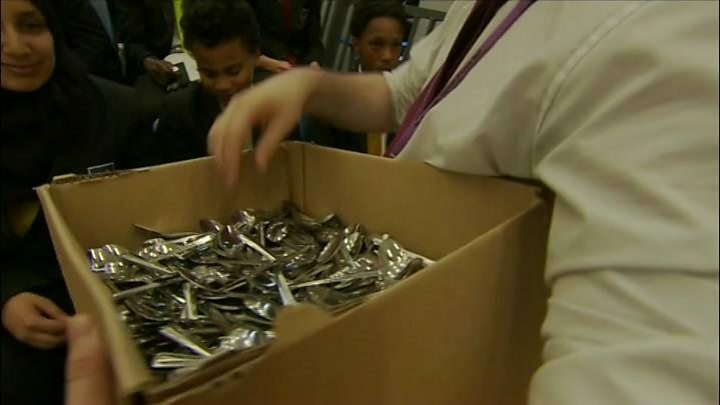 Harinder Kaur, from the school, said the spoons can "save lives". She said that 80% of UK forced marriages happened abroad during the summer holidays. "In the six-weeks holidays we know there is no contact between school and the family and families have that opportunity to go abroad, get their child married and come back," she said. "It's a way of making our children aware there is a safety net there." A law making it a criminal offence to force people into marriage came into effect in June 2014. Parents who force their children to marry can be punished by up to seven years in prison. If you or someone you know has been affected by forced marriage you can find several organisations that may be able to help here.